Getting information to customers quickly is one of the greatest benefits of Zipwhip’s texting-for-business software. Auto-reply plays a big part of that, but our Keyword tool is another popular way to not only automate responses to customer questions, but to encourage them to engage with your business. Zipwhip Keywords offer enhanced customer engagement and unique marketing opportunities for businesses. Get inspired with these 10 smart examples from our customers. An email signature is an easy placement to encourage customers to use Keywords. We really like this example from The Musante Group with PNC Bank because it’s an excellent use of a text response system. For example, let’s say Mr. Musante’s customer has just finished reading his email but now has follow-up questions about rates. The customer sees the Keywords in the email signature and notices the word RATE can be texted to the 800 number. By texting in the Keyword, the customer can receive information on current rates right away instead of having to wait for an email response from Mr. Musante. When you’re a sports fan, getting tickets to game day is almost as exciting as going to the game itself. You’re about see your team live and in action! But if the ticketing process isn’t as smooth as it could be, it could put a damper on an otherwise fun moment. Texting designated Keywords offers a fast way for customers to get questions answered so they can purchase tickets and get on with their day. 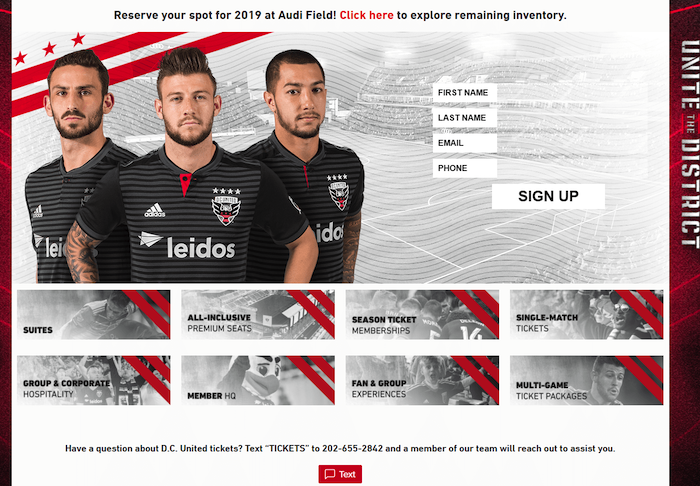 In this example, D.C. United lets customers know that texting is not only available, but an actual person will text back on the line. Texting “TICKETS” to their 10-digit line helps keep the customer service team organized, too, because the Keyword immediately signals to the team what kind of inquiry that customer will have. We also love that the team has a Click-to-Text option, which lets customers send in a text request to their mobile phone. Since all mobile carriers have different character limits per message, Zipwhip caps the character count at 250 for every text. This ensures that your message will be delivered no matter which carrier your customers are using. 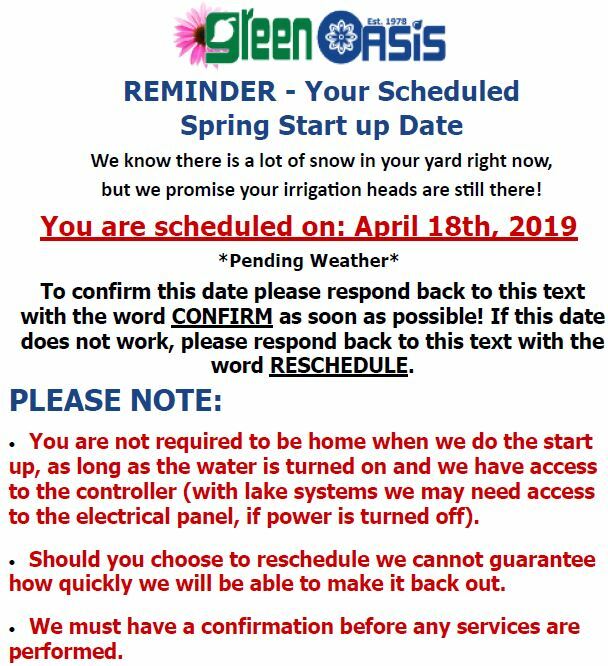 One of our lawn care customers, Green Oasis, gets around the character limit without bombarding their customers with message after message. When confirming appointments, they create an image with relevant information, including the scheduled date and what the customer needs to do in preparation for their appointment. They also include a call to action using Keywords. Customers see that they can text CONFIRM to confirm their appointment or RESCHEDULE to set up another time. We love this approach because not only do customers have all the information they need in one place, but changing or confirming dates can be done quickly by texting in a single word. LinkedIn has changed how we all look for jobs, but NewVine Employment Group kicks it up another level. 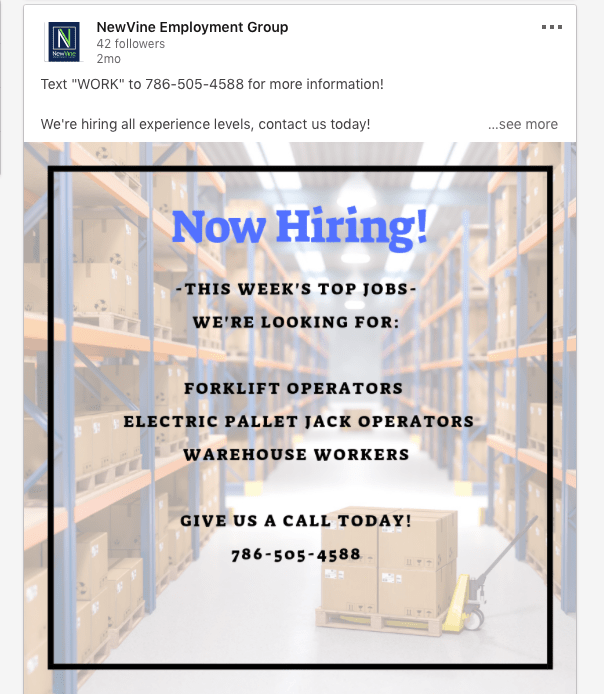 In a recent LinkedIn post, NewVine asked their audience to text the Keyword WORK to their number for more information about the week’s top job openings. We really like this approach because it lets job seekers get in front of the staffing agency fast, saving the agency hours of time they would have spent searching for and reaching out to interested candidates. This customer example gets double the praise for its use and advertising placement. 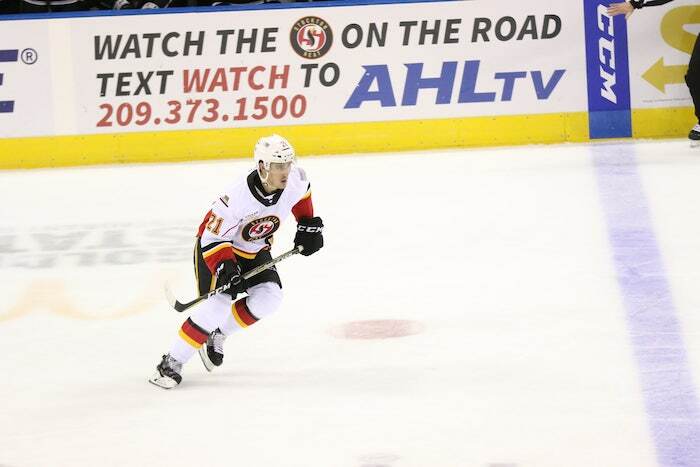 Thanks to an ad right on the perimeter of the rink, fans of the Stockton Hockey Team know they can text WATCH to view live games on the go. Fans are almost guaranteed to see the ad, and the incentive to watch games from anywhere is enough to pique a fan’s curiosity to text the number for more information. 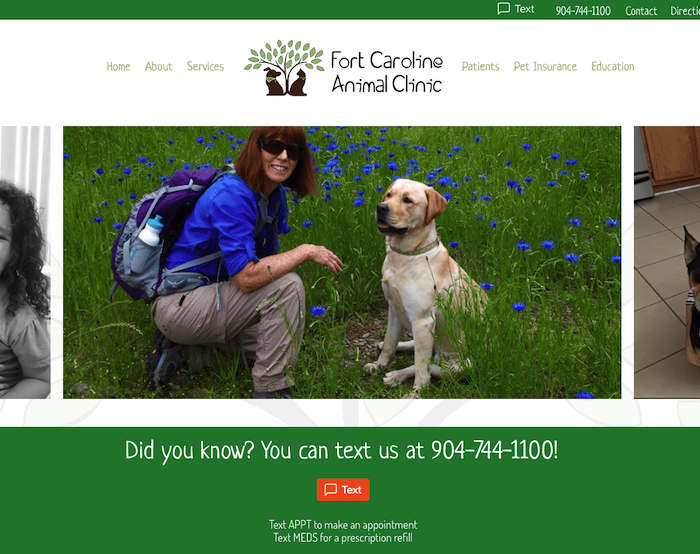 This example comes from our animal-loving friends at Fort Caroline Animal Clinic. The Clinic signals loud and clear on their home page that customers can text their number to reach them, but they also use that placement to encourage Keyword use. To conveniently schedule an appointment, customers can text in the Keyword APPT, and to refill a prescription, customers can text in the Keyword MEDS. It can get noisy in an animal clinic, so having a texting option to accomplish these two common requests makes the experience more pleasurable for the customers and the staff. Texting is a high-urgency channel, so it’s a great opportunity to use Keywords for time-sensitive occasions like flash sales. 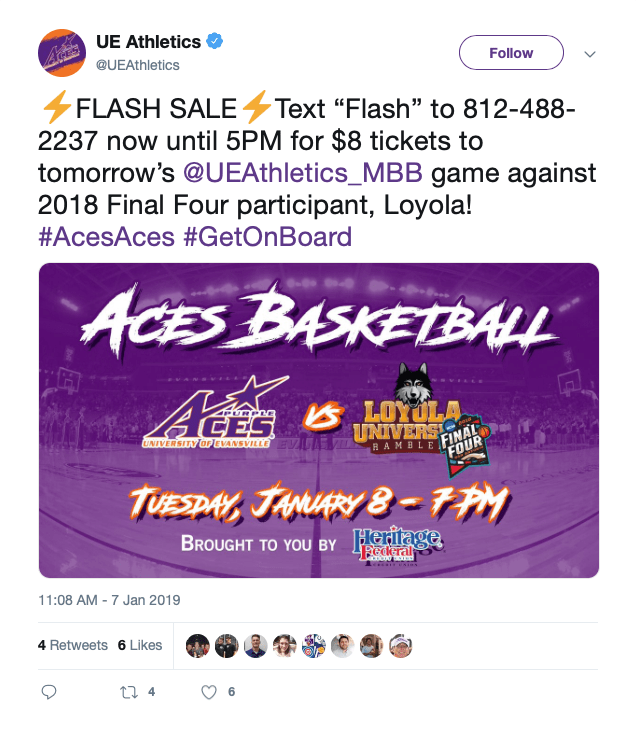 In this example, University of Evansville Athletics asked their Twitter followers to text FLASH to score tickets to the following day’s basketball game for only $8. It’s a super convenient way for customers to take advantage of a sale because all they have to do is pick up their phone and send a one-word text. Here’s another example of offering sports fans a convenient way of getting tickets to game day. Oklahoma State University Football enabled texting to their phone line to let fans text in with questions about ticket sales and renewals. Texting is used in all of OSU’s athletic facilities, too, as part of in-game fan interactions, contests and updates on changes in weather or game times. 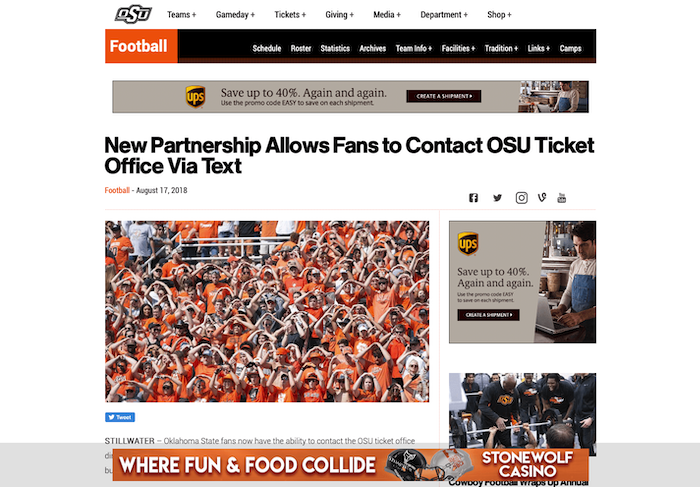 To get customers interested during the initial launch, OSU Football offered a limited-time offer to fans with the Keyword “GOPOKES”. It was a smart way to build excitement over the new texting service and to introduce how it works with the incentive of an exclusive deal. Yep, the Zipwhip team loves using Keywords, too! 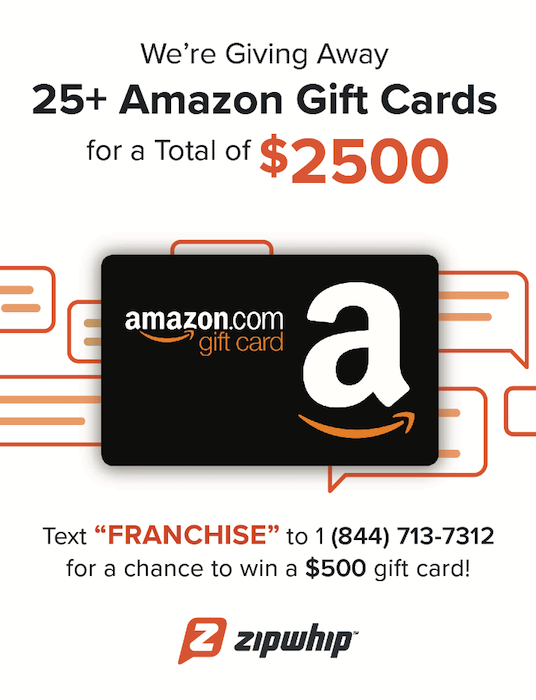 At a recent industry event, we used our Keyword feature to encourage attendees to participate in a gift card contest. We had over 200 entries and attracted plenty of folks to our booth. It was an amazing opportunity to not only interact with attendees, but they got to see our product in action, right from their mobile phones. 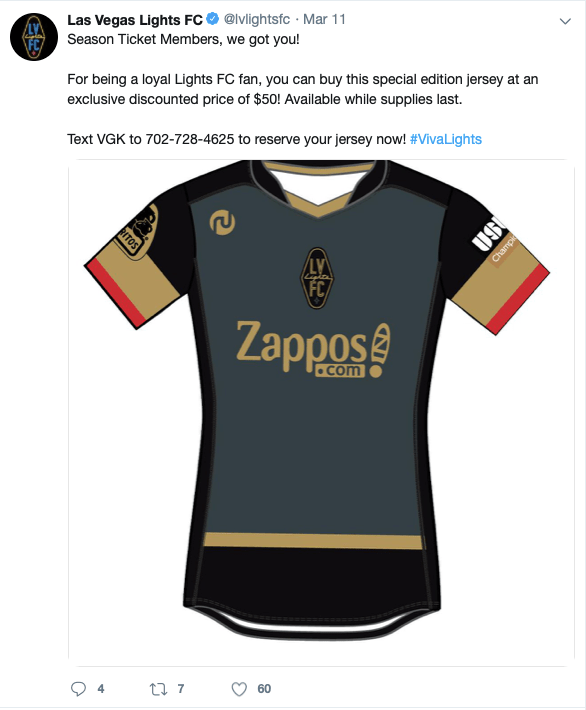 This a fun example from the Las Vegas Lights FC professional soccer team. For season ticket members, the team offered a special edition jersey at an exclusive discount via a Twitter post. Members had to text the word VKG to reserve their jersey. The post itself experienced high engagement and many fans were happy to score a coveted jersey for only $50. Click here for more information on Keyword Reporting and to watch a short tutorial video on how to get the most from your data.